This review is of the cut shown at the BFI London Film Festival in October 2016 – the UK release date is currently listed for January 20th 2017. Before I go any further into my thoughts on The Birth of a Nation, I feel I should address the elephant in the room. Not because it has anything to do with my overall opinion, but because when people now think of the film all they think about is the controversy surrounding its lead actor/director/writer/producer Nate Parker. Of course, nobody can really know the truth outside those who were involved, but whether or not the accusations held against Parker are true or not, the damage has already been done, and the once-lauded Sundance hit with heaps of Oscar buzz surrounding its initial screening there has landed with an ineffective thud. For a film that was incredibly well-intentioned, it’s honestly a shame that the scandal has overshadowed what is otherwise a pretty solid film, though not without a healthy share of flaws. Parker’s passion project, in the works for years and only made possible by a series of investors as well as his own savings from previous acting gigs, tells the story of slave Nat Turner, whom Parker also portrays in the film. Initially born into a live of servitude and hostility like his fellow slaves, he is later brought up by a plantation owner’s wife (Penelope Ann Miller) and taught to read, specifically the Bible as the other books are intended only for whites. As an adult, Parker becomes a preacher, and delivers sermons to the slave community, and then later with the owner’s son and his childhood friend Samuel (Armie Hammer) travels to several other plantations to spread the gospel to aggravated slaves. It’s here where Parker witnesses some of the true atrocities of slavery, and eventually decides that something must be done, eventually leading to an all-out rebellion. I say “eventually”, because the film doesn’t really focus on the rebellion itself – arguably the crux of the story and why Parker is regarded as a major historical black figure – until the third act of the film, and before then it just plays like a somewhat milder version of 12 Years a Slave. That’s hardly the film’s fault, given how the comparison is pretty much inevitable due to the subject matter, but Steve McQueen’s Oscar-winning film perhaps took a few more chances with its depiction of violence and the sheer brutality that came with slavery, while here it can come across as a little exploitative and without such a strong emotional context to support it. Sure, it’s incredibly uncomfortable watching these people suffer at the hands of their owners – a slave’s teeth is knocked out by a hammer so they can be force-fed, while a female character’s face is badly bruised and inflated by a group of aggressive slave runners led by a fierce Jackie Earle Haley – but honestly, and I do feel a bit guilty in saying this because again it’s about a rather sensitive topic, I felt like I had seen these kind of things done better in other movies like this one. Not to say that it’s done terribly here, but because there isn’t really a focused emotional backing to it like there was in 12 Years a Slave, it falls a little flat in Parker’s film. Incidentally, as a first-time director, you can tell that Parker is eager to go all out with this one when you see just how visionary and auteur-like it’s trying to be. However, you can also feel how self-aware he is of the importance of the story he is trying to tell, which can lead to him getting a bit carried away with some of the symbolism and heavy imagery (for example, when the previously-mentioned female character’s bruised face is shown, it instantly cuts to a shot of blood seeping out of an ear of corn), sacrificing the subtlety for something more artsy. It’s a problem in how distracting and sometimes unintentionally funny it can be, particularly one heavenly ending shot which is so on the nose it might as well be the nose. Thankfully, it’s not all throughout the entire film, but Parker could have easily done away with these moments of self-importance and the overall film would not have been altered at all; that’s how painfully obvious it is that he just wants to show off behind the director’s chair. As an actor, he delivers a solid performance that carefully makes us forget that upon closer inspection, there’s not a whole lot to this character as he is written in this film. His ensemble cast also benefits from having someone who clearly understands acting in charge of the production, and each one of them gives good performances as a result. Hammer, in particular, excels as a slave owner who goes through his own min-arc, which – ironically for a film that’s meant to be about a slave uprising led by a black man – ends up being one of the more compelling character arcs in the entire film; while Aja Naomi King, as a slave named Cherry who later becomes Turner’s wife, ends up stealing a few scenes even though she’s side-lined and all but ignored for a majority of the film after a certain incident. There’s not a foot out of place with the actors involved in this film, and it’s Parker’s strength as an actor himself that he’s able to spread his abilities to actors who are capable of delivering performances that are just as powerful as him. So, should Parker’s alleged past cloud your judgment on whether you should see The Birth of a Nation? Honestly, that’s entirely up to you as a viewer; but even when you take that whole thing out of the equation, it’s still a completely fine movie that has a number of flaws, but overall isn’t bad. Sure, the awards buzz from Sundance might have virtually died since the allegations came out, but if you want to see a compelling slave drama that isn’t quite 12 Years a Slave but also doesn’t squander its own sense of importance, then it’s worth checking out at least once. 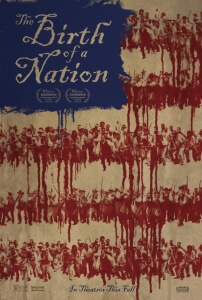 The Birth of a Nation might have been overshadowed by the accusations made against star/writer/director Nate Parker, but that shouldn’t stop you from seeing the film as it is overall a pretty decent, if flawed, tale of a slave uprising that should definitely be talked about, regardless of whether or not it’s being talked about for the reasons it had intended.